Henry Jones Domville was born on 16th December 1818 in Greenwich, the fifth child of ten of James Bell Domville MD RN (1778-1846) and Sarah Rebecca Domville née Smith (1786-1825). Like his father, he served in the Royal Navy as a surgeon. Of his brothers, Dudley (1815-1835) served in the Royal Navy as a midshipman, James (1817-1883) served in the Royal Artillery as a Lieutenant-General, David (1820-1866) served in the Royal Navy as a chaplain, William (1822-1879) also served in the Royal Navy as a surgeon, and Edmund (1825-1901) served as a Lieutenant-Colonel in the Royal Marines. Henry's mother died two days before Christmas Day, 1825, when he was seven years old. His father remarried in 1828, Mary Efford Kellock (1794-1859). Mary and her sister Catherine had previously opened a school in Greenwich, and Henry and his brothers were pupils at this school. From his father's second marriage, Henry gained two half-brothers, Edward Acheson Domville (1829-1880), who later worked in the Greenwich Hospital Schools, and Charles Kellock Domville (1831-1904), who became a railway engineer in Ireland and Ontario. Inspector-General Henry Jones Dumville, C.B., M.D., Honorary Physician to the Queen, died at South Hill, Paignton [Devon], on July 8th, in his 70th year. Entering the service as Surgeon, May 18th, 1839, he became Staff-Surgeon, November 9th, 1849; Deputy Inspector-General, November 8th, 1864; and Inspector-General, February 13th, 1875; and retired December 17th, 1878. Henry Domville's younger brother, William Thomas Domville CB MD (1822-1879), who was also a surgeon in the Royal Navy, served on HMS Resolute in 1853, in the search for Rear-Admiral Sir John Franklin and his expedition to the Northwest Passage. During the search expedition, Domville Point in Wellington Channel in the Arctic was named after William Domville. The bombardment of HMS Tiger by the Russians, after she had run aground in fog, and her surrender, occurred on 12 May 1854 during the Crimean War. The severely wounded, on whom Henry Domville operated, included the captain, Henry Wells Giffard, age 44, who died of his wounds twenty days later on 1 June 1854; midshipman John Giffard, age 19, who underwent amputations of his left thigh and his right leg, and who died on the day of the bombardment; John Trainer, age 39, who was captain of the maintop, a forecastle gun which was the only gun that could respond to the heavy fire of the Russian field batteries, and who died the same day; Thomas Hood, age 17, who was serving as powder boy on the forecastle, and who died the next day; and William Turner, age 20, who recovered from his injuries. 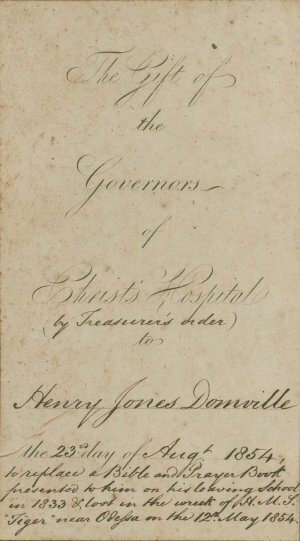 In addition surgeon Henry Domville lost all his notes, 'both public and private'. on returning to England Henry Domville was employed in charge of small-pox and scarlet fever patients during an epidemic at Haslar Hospital; in the Duke of Wellington in the Baltic, employed blockading Oronstadt and other Russian ports, and present at the bombardment of Sveaborg (Baltic medal); was sent to Bermuda Hospital, 1865, and to Jamaica Hospital, 1874, on each occasion of the epidemic of yellow fever breaking out in those islands, and has served in Plymouth and Melville Hospitals, and the Royal Marine Infirmary at Woolwich. He was nominated a Companion of the Bath in 1867, and appointed Honorary Physician to the Queen in 1879. He was in receipt of a pension for long and meritorious service. In their later years, Henry and his wife Felicia lived in Totnes, Devon. They both died in 1888. The vacancy in the Deputy-Inspectorship at Plymouth, caused by the lamented death of Dr. Beith, R.N., is one which the Director-General of the Navy will not find it an easy task to fill satisfactorily, since Dr. Beith's abilities as an operator enabled him to fulfil the duties of his office more efficiently than had been the case for many years. We have reason to believe that the gentleman who in all probability will be selected is Dr. Henry Jones Domville, C.B., now Deputy Inspector at Bermuda, who, it may be remembered, distinguished himself by operating under fire, when H.M.S. Tiger was so unfortunately lost in the Black Sea; and who will prove himself no unworthy successor of Dr. Beith. Dr. Domville became a deputy-inspector in 1864, and has served at the Bermuda Hospital since that date. Promotion of a staff-surgeon will necessarily ensue, and in naval circles, we understand, that the names of Dr. Thomas Nelson, Dr. Robert Pottinger, and Dr. J. Watt Reid, have been mentioned as likely recipients of promotion. We have reason to believe, however, that Dr. Nelson, at present attached to Melville Hospital, Chatham, and who was present both at the attack upon Petropavlovski, and in China at the taking of the Peiho forts, will probably be the new deputy inspector, a choice which will give general satisfaction. in 1833 & lost in the wreck of H.M.S. "Tiger" near Odessa on the 12th. May 1854. Some of the information for this page was kindly provided by Don Armitage, author of The Voyage of HMS Tortoise to Australia and NZ 1841-3 and other works. The photograph of the inscription in the Bible was kindly provided by George Collings. Does anyone have a photograph or a painting of Henry Jones Domville, or know of the whereabouts of one? Henry Jones Domville made some sketches while he was in New Zealand. We would be very interested to see any of these sketches or any other sketches he made, or to have information on any of them.